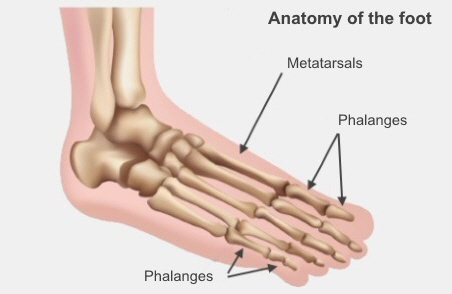 Your metatarsal bones are the long, straight bones in the middle of your foot. If your metatarsals are fractured, it means they are broken. Metatarsal bones often break when a heavy object falls on to your foot. The outside bone can also break because of a twisting injury at the ankle or by kicking a heavy object. Runners can develop stress fractures in these bones, caused by repeated force on their feet. How are broken metatarsals treated? A broken metatarsal can be treated in different ways. If your bone is broken in a good position but is stable, you may be put into a plaster of Paris cast to support your foot and stop the broken bone from moving while it heals. You will learn how to use crutches or a frame to get around. Your doctor or nurse will also tell you how much weight you can put through your injured foot. You will have a follow-up appointment at the Orthopaedics Outpatient Clinic one to two weeks after your injury, to check how well you are healing. This will include an X-ray. If the metatarsal on the outside of your foot has a small break (called an avulsion fracture), it may be treated with a Tubigrip bandage and crutches to help you walk. You might need an operation to move the bones in to the right position and fix them in place. This will happen if the broken bones are not in a good position or are unstable, or if you have also dislocated the joint of your bone. This may involve using a metal plate, screws or wires. Your orthopaedic surgeon will talk with you about this before any surgery. Before and after surgery you may have a plaster of Paris cast or backslab (this is a half cast on the back of your leg) to support your leg and foot, and stop the broken bones from moving. If you are older than 65, Older Person's Health Specialist Services will also see you and review your health with the orthopaedic team. After surgery, your foot will be up on a pillow, to make sure it doesn't swell too much. You may have some numbness or tingling in your foot, but this will eventually go away. Your nurse will regularly check that the blood flow to your injured foot is all right. They will also check how much pain you are feeling and give you pain relief, which your doctor will have prescribed. You might also continue taking antibiotics, if your surgeon thinks you need them. A physiotherapist will see you and will try to get you moving as soon as possible. This helps to prevent the problems that can happen with long periods of bed rest. These can include deep vein thrombosis, infections, and muscle weakness. Your doctor will let you know how much weight you can put on your leg. A physiotherapist will teach you about weight bearing and walking with either a walking frame or crutches. Before you leave hospital, a physiotherapist and occupational therapist will find out and arrange whatever help you might need. If you are worried in any way about going home, talk to a social worker and let them know. When you leave hospital, you will get a follow-up appointment, a discharge letter that explains what has happened to you and your treatment plan, and a prescription and medication card if you need them. If you are worried about anything after you go home, please see your GP. Written by director of nursing, Orthopaedic Services, Canterbury DHB. Adapted by HealthInfo clinical advisers. Last reviewed June 2016. Last updated November 2018.